This entry was posted on February 8, 2017 by usblog. As far as obligatory-gift-giving-holidays go, Valentine's day is without a doubt the most stressful. I mean, at Christmas time you can get away with giving some pretty weak gifts. I think most of us have uttered some falsely overjoyed line similar to: "Oh, a £5 gift card to Starbucks again this year? Thank you so much auntie!" But Valentine's day is different. The gift you're giving has to be significant - I mean you are giving it to your SIGNIFICANT other, right. And unfortunately, gone are the days of "everyone gets a valentines day card!" of primary school - we were all in it together back then. No, now you actually have to put in some thought and effort - thats why I'm here help you find last minute Valentine's Day gifts! Okay, I'm starting out simple and cost effective. If you guys are super broke and can't afford to buy your significant others any presents whatsoever, breakfast in bed is a great move. I know you were considering a coupon book for "free hugs and what not" this year, but you're not six anymore. Actually, looking back, that was probably the greatest opt-out ever. Give one of those to your parents and they thought it was adorable and funny. Not so much in this situation, though. 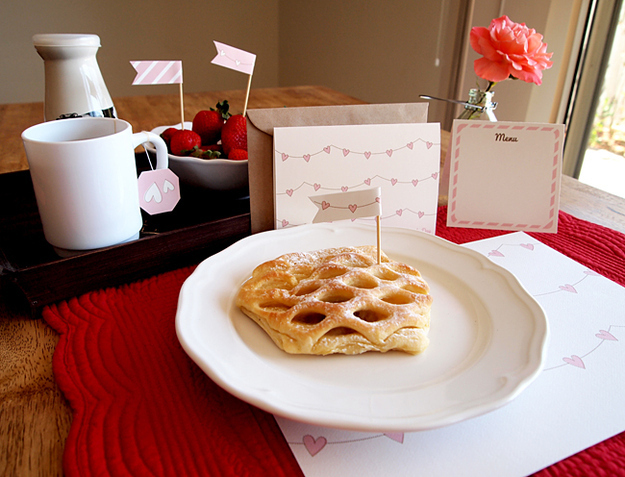 Breakfast in bed is a classic romantic display that's both thoughtful and inexpensive. Pretty much the ideal combination. So, if you're like me and have forsaken all your loved ones by buying yourself presents all year - this is the gift for you! What's that? You're not a terrible person like me, you say? Firstly, get off your high-horse, no one likes a show off. Secondly, I've got a great suggestion for you! If you're looking to show that you actually value and charish your relationship, a well thought out and personal gift is probably the way to go. This isn't like giving your great unlce socks for his birthday, this gift should be meaningful. I think a personalised phone case is a perfect option to show this. You can choose a picture of yourselves together, you can add meaningful text, sounds just about right! And, how convenient, you can do that right here at GoCustomized! Choose a device, case type, then find a nice picture of your choice (you can upload them straight from Facebook and Instagram, too) and there you have it! Easy. Now you don't have to spend the day begging for forgiveness becuase you went ahead with that coupon book for "free hugs and what not" that I warned you about. Whats that? A personalised phone case is a perfect gift idea and you're forever indebted to me for suggesting it? Well, it was my pleasure! What's that? You can't find a nice picture together or come up with any romantic text? Well, no need to worry, we still have you covered. We also offer gift cards so that you can pass the task of designing on to your S/O that may be more romantically inclined. This allows you to give a thoughtful, personalised gift without unknowingly choosing a terrible, unflattering photo of your S/O that will then be permanently engraved on their phone case forever! It's the safe move. So there you have it! Hopefully I was able to help save your relationship next week. What are your thoughts on Valentine's day gifts? Let us know in the comments! This entry was posted in Phone cases, Gift ideas, Accessories and tagged valentine's day, phone case, personalised phone case, gift ideas on February 8, 2017 by usblog.